Fiery, passionate, intense, futuristic – Miles at his blistering best! The Miles Davis Deluxe Box Set series has garnered 8 Grammy awards to date! 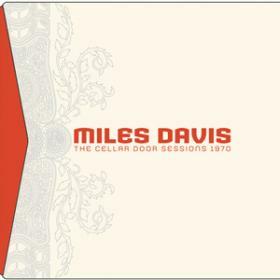 Here is the Miles Davis collection that his legions of American fans have most eagerly awaited. The Cellar Door Sessions documents the great trumpeter-bandleader David at the helm of one of his most stimulating and electrifying groups. The sextet on The Cellar Door‘s bandstand – Davis, saxophonist Gary Bartz, Keith Jarret (playing electric organ and electric piano), Motown bassist Michael Henderson, drummer Jack DeJohnette, and percussionist Airto Moreira – is a sheer marvel of kinetic energy. And adding more visionary pyrotechnics is the blazing guitar of John McLaughlin. Every member of this Davis band has subsequently proved to be a major figure in jazz; in his own way, each has placed a highly personal stamp on improvisation during the past 35 years. Bringing additional luster to this deluxe package are six highly-individual essays of four unforgettable nights by each of the men who, with their leader, were exploring the heavens and creating the music that elevates The Cellar Door.